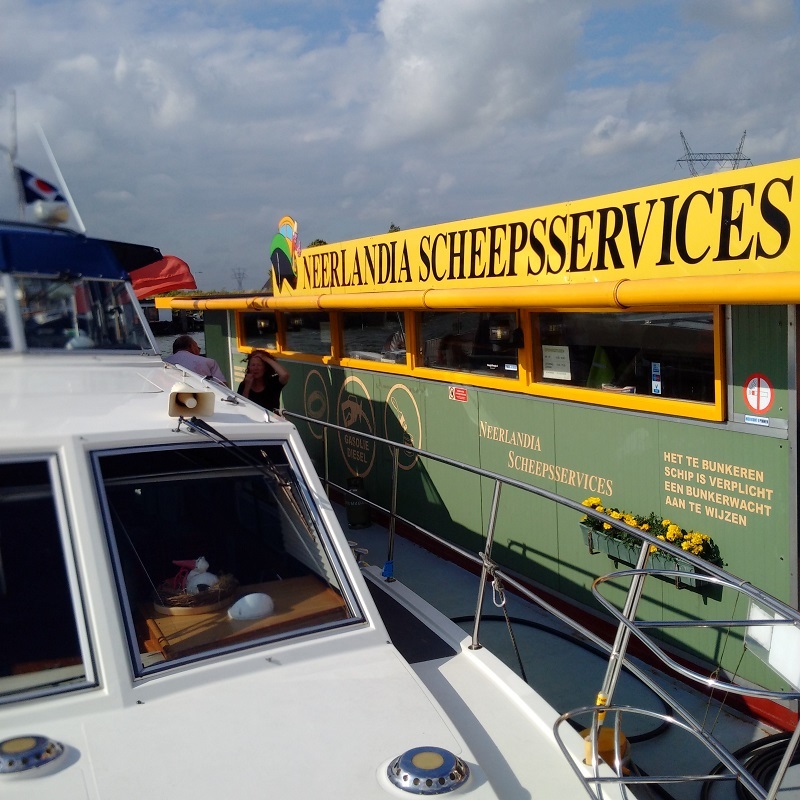 Cruise from Spakenburg with Inez to Naarden where she drove us to the town to enjoy a nice Italian lunch and then back aboard Lady Martina without her for the cruise to Amsterdam, ready for our next arrivals. Today, we started off by taking the boat over to the water stieger opposite and spending two 50c pieces which filled the tanks and gave some left to wash down the decks. Then the cruise along the Randmeren and the conditions that we first experienced then reflected those occurring for the rest of the day. The breeze rose to above 20knots and, although we were comfortable with this, it influenced what I had to plan for the rest of the day. 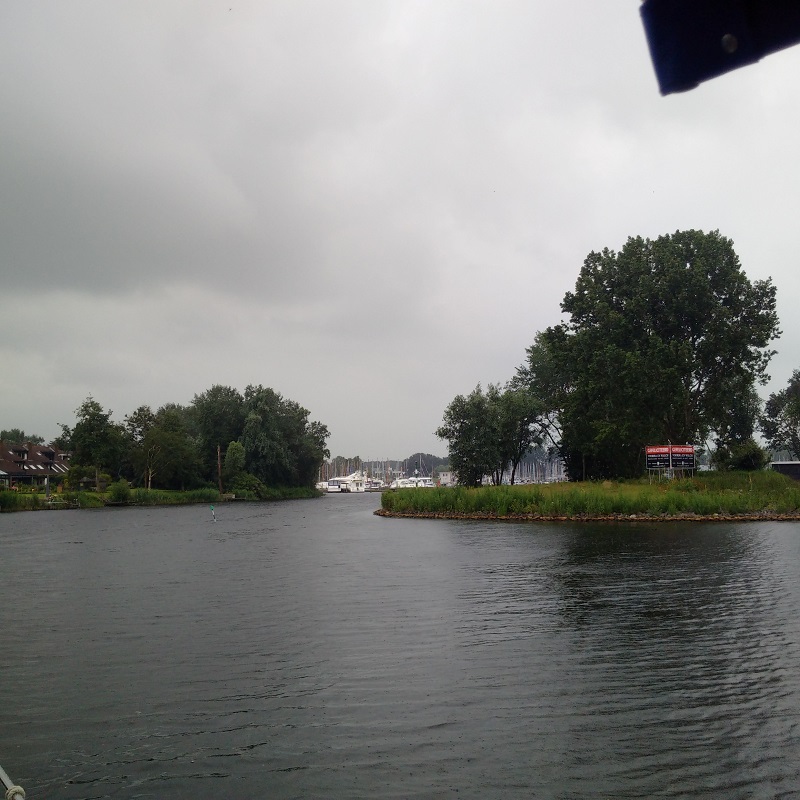 The cruise along the Emmer and down the Naarden channel went according to plan but we had some very sharp rain showers that spoilt our arrival and kept us inside for a while. We took Inez’s things and accompanied her to her car and also dropped off at the harbour office to take advice and research the weather prospects. Now, the marina is a way away from the town of Naarden, which seems to be inaccessible by boat, which is a shame. The other problem is that the whole marina is very big and modern and you almost need the bikes to get around it; without making the trip to the town itself. This, combined with the forecast of more wind to come in the next few days, with first thing tomorrow being the only slack spell, made me decide to move Lady Martina on to Amsterdam where we could meet our news guests and avoid the windy Ijsselmeer. I gave Max a quick walk before we left, allowing him ashore and then calling him back later. I thought I heard him jump aboard and then looked for him and found that he had mistimed his jump and ended up in the water! Unfortunately, the quay was so low that we could not reach him to haul him out until much later and had to attract him towards the bathing platform for Kathleen to catch him and then me to lift him out by his collar! We then set off and cruised straight back in 20 knots winds in the Markermeer which were challenging our ‘porch’ canopy again. I managed to cross this open water space, navigate us under the large bridge and through the Orangesluis complex before cruising steadily towards Amsterdam. I noted the fuel barge on the way that I had often used and so cruised over to it and moored up, looking to fill up with diesel. Unfortunately, they did not take credit cards and so we could only get so much and the water nearby was very choppy with a very fresh breeze, making it difficult to get away afterwards. 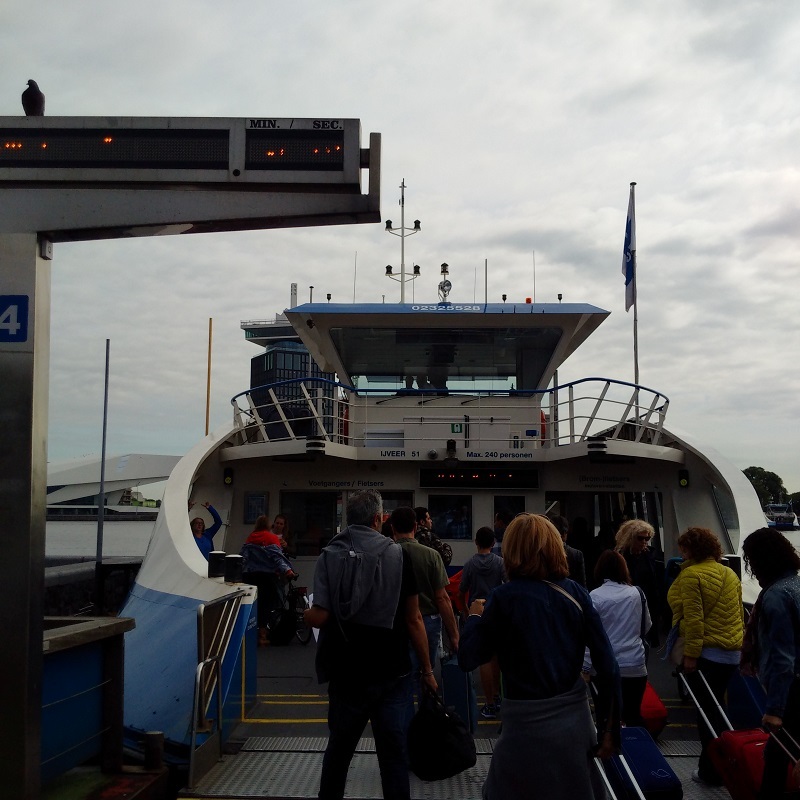 We managed all that, cruised along the Nordzeekanaal to Six-Haven and entered the Marina only to find it full for our length of boat and so we had to cruise on the fair way up to the Amsterdam Marina where I found a hammer-head and got us moored up.